Includes Sport Package, Navigation & More. Not only will you find Audi models at our dealership, serving the greater Bellingham WA, Marysville WA, Whidbey Island WA, Coupeville WA and Oak Harbor WA areas as well as the San Juan Islands - you'll also find a friendly and accommodating staff eager to assist you. That's true no matter what you're looking for - be it a test drive in a new Audi A3, A4, Q3, Q5, Q7 or used car, auto financing options, car service appointments, or help figuring out what auto part you might need. No matter your preference, Audi Bellingham has plenty of Audi options to choose from. Our online inventory is constantly being dated with listings of vehicles available in our showroom, including the Audi A3, A4, Q3, Q5 and Q7.What matters most, though, is your opinion, and which model grabs your attention. We believe the process should be as stress-free as possible, so relax, keep an open mind and try to picture yourself behind the wheel. If a new car isn't tickling your fancy, a vehicle from our broad selection of used Audi inventory is sure to do the trick. There are many advantages to opting for a pre-owned auto, including a cost savings. Moreover, each car we offer at our dealership in Bellingham exceeds our strict standards for quality, reliability, and performance. So, you've found your favorite Audi: now what? Audi Bellingham, proudly serving Mount Vernon WA, Marysville WA, Lynden WA, Anacortes WA and Sedro Woolley WA makes car financing simple for drivers in Bellingham, the San Juans and the surrounding areas. After helping you discover your next new or used Audi A3, A4, Q3, Q5 or Q7, Audi Bellingham doesn't simply disappear. We know that car loan and lease options can quickly become confusing, especially when you're not well-versed in the topic. That's when our Audi lease experts jump into action; these financial gurus are available to answer any questions that you may have and help to guide you down the path to ownership! Once you're the proud owner of an Audi model, Audi Bellingham wants to help you keep that new car as safe, efficient, and well maintained as possible. Our factory trained staff are pleased to provide you with onsite car service and repair. We utilize the latest technology and exclusively use only official Audi parts for any vehicle repair, or upgrade. Simply put, Audi Bellingham provides the full Audi ownership experience, which is why so many drivers travel from all over to visit us at 2200 Iowa Street in Bellingham, WA. If you're interested in seeing why we're the go-to team for everything Audi, come visit us today. Not only will you find Audi models at our dealership, serving the greater Bellingham, Marysville, Whidbey Island, Coupeville and Oak Harbor areas as well as the San Juan Islands - you'll also find a friendly and accommodating staff eager to assist you. That's true no matter what you're looking for - be it a test drive in a new 2018 Audi A3, A4, Q3, Q5, Q7 or used car, auto financing options, car service appointments, or help figuring out what auto part you might need. No matter your preference, Audi Bellingham has plenty of Audi options to choose from. Our online inventory is constantly being dated with listings of vehicles available in our showroom, including the Audi A3, A4, Q3, Q5 and Q7.What matters most, though, is your opinion, and which model grabs your attention. We believe the process should be as stress-free as possible, so relax, keep an open mind and try to picture yourself behind the wheel. If a new car isn't tickling your fancy, a vehicle from our broad selection of used Audi inventory is sure to do the trick. There are many advantages to opting for a pre-owned auto, including a cost savings. Moreover, each car we offer at our dealership in Bellingham exceeds our strict standards for quality, reliability, and performance. So, you've found your favorite Audi: now what? Audi Bellingham, proudly serving Mount Vernon, Marysville, Lynden, Anacortes and Sedro Woolley makes car financing simple for drivers in Bellingham, the San Juans and the surrounding areas. After helping you discover your next new or used Audi A3, A4, Q3, Q5 or Q7, Audi Bellingham doesn't simply disappear. We know that car loan and lease options can quickly become confusing, especially when you're not well-versed in the topic. That's when our Audi lease experts jump into action; these financial gurus are available to answer any questions that you may have and help to guide you down the path to ownership! Once you are the proud owner of a Audi model, Audi Bellingham wants to help you keep that new car as safe, efficient, and well maintained as possible. Our factory trained staff are pleased to provide you with onsite car service and repair. We utilize the latest automotive car care technology, and exclusively use only official Audi parts for any vehicle repair, or upgrade. Simply put, Audi Bellingham provides the full Audi ownership experience, which is why so many drivers travel from all over to visit us at 2200 Iowa Street in Bellingham, WA. If you're interested in seeing why we're the go-to team for everything Audi, come visit us today. 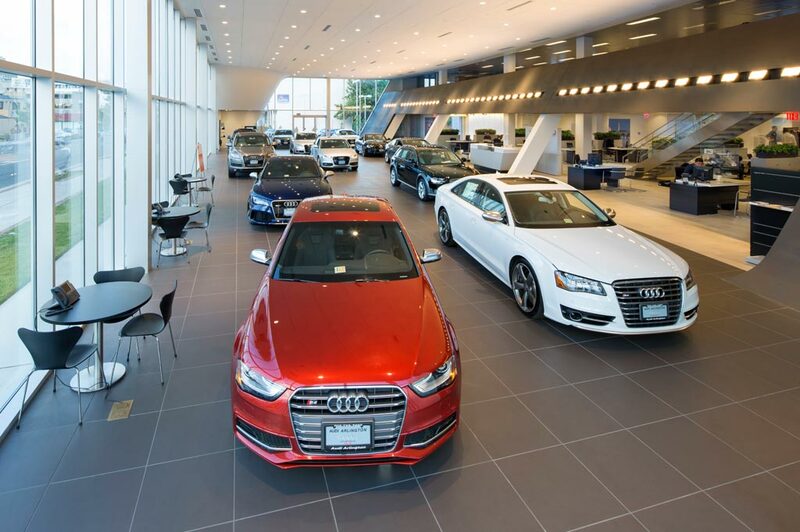 Audi Bellingham in Bellingham, WA treats the needs of each individual customer with paramount concern. We know that you have high expectations, and as a car dealer we enjoy the challenge of meeting and exceeding those standards each and every time. Allow us to demonstrate our commitment to excellence! Our experienced sales staff is eager to share its knowledge and enthusiasm with you. We encourage you to browse our online inventory, schedule a test drive and investigate financing options. You can also request more information about a vehicle using our online form or by calling (360)734-5230.